You choose which vendors you prefer. Check out our list of vendors and talk to one of our consultants through phone, e-mail or an onsite consultation. Our consultant will visit your site to ensure that the size of the vending machine is a good fit for the total number of people on site. He/she will evaluate the area, with space and accessibility to doors and stairs as the determinants of the vendor’s size. We will also propose alternatives in case the area is not ideal for your preferred vendor. One of these is a type of our larger vendor that has removable cabinet inserts, so it can weave through doors narrower than the overall dimension of the vending machine. Once the type of vendors settled, the product range is selected. 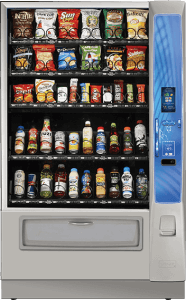 Your Choice Vending will provide an extensive selection of products you may choose from. You may opt for a range entirely composed healthy options, or a mix of healthy and regular drinks and snacks. The mix choice is yours. Otherwise, we can provide you a range of options aligned with your requirements. If you already have choices in mind that may not be included in our list, we’d be happy to source them out for you. We give you the flexibility to change your choices as we go along. We understand that “IN” choices are constantly changing, and we’d love to move with the trends to keep you satisfied. Delivery will take place within 10-14 days. We will use our professional transport contractor who has the experience and specialised transfer equipment, including a stair climber trolley to ensure that your vendor is delivered and installed safely and damage-free. We will fill the vendor/s with your selections, cash up the machine to ensure that it is ready to vend for your staff and customers. You will have direct access by phone or email to the operations manager and the service manager. They will ensure that all of your requests are attended immediately. Our team will make sure that vending machines will be an asset to your business, whether it’s an office, warehouse or people facility. How we work? We make it work for you.